The town of Whitney, Oregon, is a fantastic ghost town to visit, and right off the main highway between Sumpter and John Day. 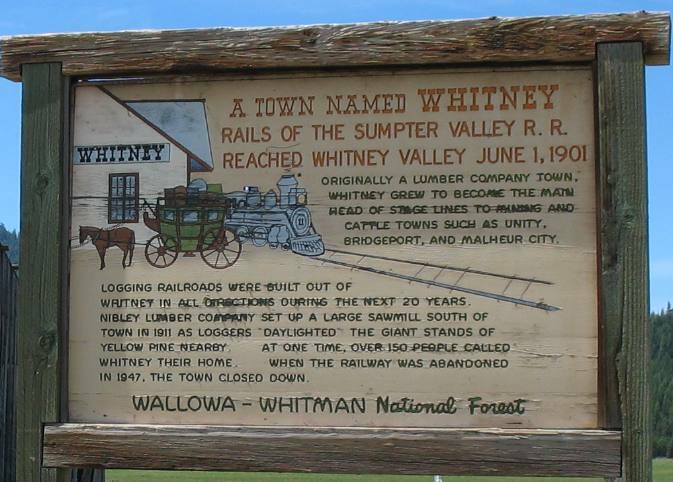 Whitney was the primary stage stop along the Sumpter Valley Railroad as well as home to many who worked in the logging industry. If you look closely, you will notice that some of the dilapidated buildings in Whitney are still occupied. Whitney is a quick 13 mile drive from Sumpter on good highway. The town of Whitney was occupied primarily by workers of the local saw mill, as well as several employees of the railroad (source: Ghosttowns.com). It was founded in 1900, and the population never exceeded 100 people. In 1918 a fire destroyed the local lumber mill operated by the Oregon Lumber Company, which caused the town to decline rapidly (source: Wikipedia). Logging Railroads were built out of Whitney in all directions during the next 20 years. Nibley Lumber Company set up a large Sawmill south of town in 1911 as loggers “daylighted” the giant stands of yellow pine nearby. At one time, over 150 people called Whitney their home. When the railway was abandoned in 1947, the town closed down. Today, you will see several wood homes and outbuildings. As mentioned, some of the homes are still occupied, so be sure to steer clear of private property. Stay on Highway 7 for 9.7 miles. You will go up and over Larch Summit at 5082 feet, then descend back down into the valley where Whitney sits. Turn left on North Fork Burnt River Road. Town starts up just a short ways downthis gravel road.